Bank stocks don’t get much love from a lot of investors since they don’t promise significant growth, and you’re not likely to see significant returns from them in a given year. Over the long term, however, there are many benefits to owning them. 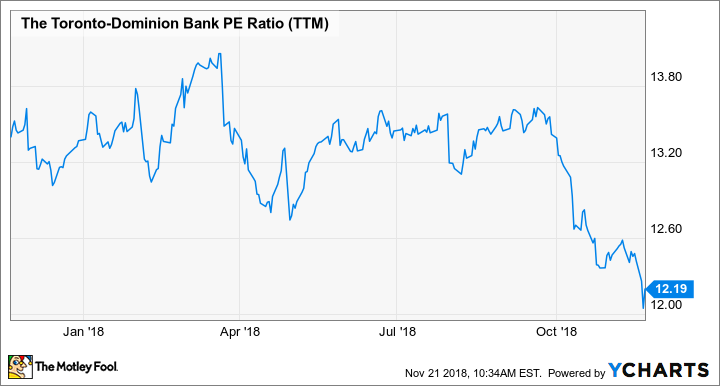 Toronto-Dominion Bank (TSX:TD)(NYSE:TD) is at the top of the list for me when it comes to bank stocks, and there are three big reasons I’d consider buying the stock today. Year to date, TD’s stock has fallen by more than 4%, and over the past three months it has declined by 10%. The last time it was at these lows was back in April, and it’s a rare opportunity for investors to buy at such a reduced price. There’s nothing wrong with the stock or the company’s prospects that would lead me to believe that it’s in trouble and could see further losses. The markets as a whole have been underperforming lately, and that has likely weighed down the stock. TD’s overall trajectory remains strong, and getting it on a dip like this can help maximize your returns. It also helps you lock-in at a slightly higher dividend yield, with the stock currently yielding a payout of around 3.7%. Typically, TD has traded at a price-to-earnings (P/E) ratio of at least 13. Currently, it’s well below that multiple and closer to 12. While this might seem like a nominal difference, at a P/E multiple of 13, its stock price would be around $76 and suggests a rally might be in order, especially since nothing has happened to fundamentally alter the business. In the short term, I wouldn’t be surprised for the stock to increase at least back to these levels. However, I could see even more of an increase happening in addition to that, especially after a strong Q3. TD is set to release its earnings soon, and it’s hard to believe the company wouldn’t have another good quarter. And a strong performance will give earnings a boost, which in turn will lead to a higher share price and could send the stock close to $80. In addition, the bank is on pace for another dividend hike early next year, and investors can take advantage of an even higher yield by buying today. Last year, the company raised its quarterly payouts from $0.60 to $0.67 for an increase of 11.7%. A similar increase this year could bring the dividend to around $0.75, which, at today’s price, would equate to a yield of around 4.2%. However, if the stock price recovers by then, which could very likely be the case, the yield could be noticeably lower. TD will always be a good option for investors, but there’s even extra motivation to buy now before the stock bounces back, as the current price might not last long, especially as the markets recover.